A single by Josh Reddick in the top of the eighth inning off closer Craig Kimbrel helped push the Astros to a 5-4 win over the Red Sox Monday afternoon at Fenway Park. The loss eliminated the Red Sox from the American League Division Series in four games. Rick Porcello started for the Sox and went three innings, allowing a pair of runs on five hits and three walks while striking out three. Coming on in relief for the first time all year, Chris Sale went 4.2 innings, giving up one run on in the eighth inning on a solo home run by Alex Bregman that tied the game. Trailing 1-0 in the bottom of the first inning, Xander Bogaerts snapped an 0-for-the-series skid with a home run to right center off Justin Verlander, appearing in relief, to tie the game. 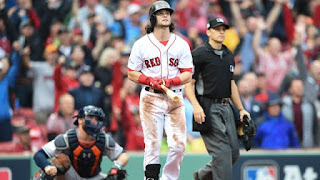 With Houston leading 2-1 in the bottom of the fifth, Andrew Benintendi (pictured) slammed a two-run homer to right to put the Red Sox up 3-2. An RBI double by Carlos Beltran off Kimbrel in the ninth added an insurance run. Rafael Devers cut the lead to one with an inside-the-park home run in the bottom of the ninth. The Astros will move on to the American League Championship Series where they will face the winner of the Cleveland Indians - New York Yankees series.